1. Apply a base coat to all nails. 2. Apply a coat of white polish on index, middle, and ring nails. 3. Apply a coat of light pink polish on thumb and pinky nails. 4. 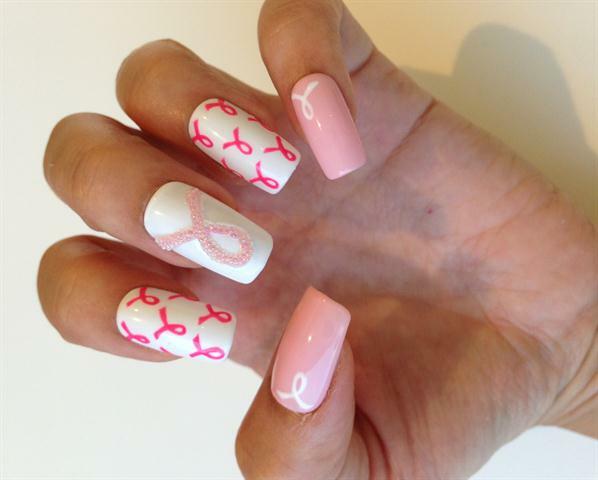 Using a striper brush and pink acrylic paint, draw a small pink ribbon on index and ring finger nails. Use white acrylic paint to draw a ribbon at the corner edge of thumb and pinky nails. 5. Draw a large pink ribbon on the middle nail. Cover the ribbon with nail caviar. 6. Apply top coat to seal design.